Welcome to the 2012 Easter and Passover Edition of The Gluten Free Nomad, where you'll learn about Foods and Recipes suitable for both Easter and Passover, since they can be easily made without leavening. There's also a Super Easy Recipe for a traditional lemon flavored Potato Sponge Cake that's great for Passover or Easter. Passover is a Jewish holiday where it is forbidden to eat anything with leavening, which eliminates normal breads and desserts. Although unleavened bread, or matzo, contains gluten, a lot of traditional Passover food does not. As a result you are likely to find many gluten free Passover foods at this time of year in your grocery store. Look for them especially after Passover, when you may find some bargains. Be sure to check labels though, as many mixes and Passover foods contain matzo, which is made from wheat and contains gluten, or other gluten containing ingredients. Gluten Free Easter Recipes can be challenging when you really want something special. And Passover food can be challenging too, when you are used to relying on leavening for making things rise. Baking with almond flour or potato flour has been traditional for Passover desserts for centuries, since leavening other than eggs is not necessary. At Gluten Free Around The World you'll find almond and potato flour recipes, and many that don't rely on leavening other than eggs. The ones that contain baking powder can easily be made without it for Passover, simply by folding in more beaten egg whites. Because the recipes at Gluten-Free-Around-The-World.com rely mostly on eggs to make them light, I've had success leaving out the baking powder or soda for my Jewish friends at Passover, and they've been a big hit. #1) Almond Flour Recipes: many flourless cakes and cookies suitable for both Passover and gluten free Easter. #2) Discovering the Almond Cookie. A page that surveys the range of almond cookies from around the world. #3) Lots of Gluten Free Cookie Ideas. Many types of cookies from many countries, made with everything from rice to corn to chocolate, even some from beans. #4) Gluten Free Recipes of all kinds from unleavened breads and cookies to meals, side dishes and delicious soups. Ingredients are in bold. Powdered sugar for dusting is optional. Beat 7 large egg whites with a pinch of salt until stiff. Gradually add 1 C minus 1 Tbsp potato starch and beat well. 4) Bake in preheated oven for 40–50 minutes. Cool on wire rack and sprinkle with powdered sugar if you like. Know any cake lovers? Easter or Passover are wonderful times to try new things, and baking traditional cakes from other traditions can be a lot of fun, especially when you have willing tasters! 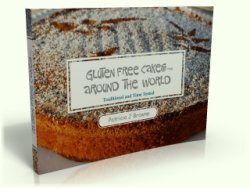 Pop over to Gluten Free Around the World and check out the eBook of Gluten Free Cakes From Around The World. If you know someone who would like this newsletter, please forward it to them.